Roz Hepple and her husband, Bob, have both been affected by Thalidomide and have been volunteers for the Thalidomide Trust for many years. Life at home can be pretty difficult – Bob is four limb deficient and Roz was born without arms – but the couple managed with Roz using her feet, until their work as volunteer visitors for the Trust made them think again. “After talking to other people about how they live with their disabilities we decided we should take a good look about how life was for us, “ says Roz, “we sat down and looked at how we were really managing, and what our house offered us in terms of ergonomics. We were living in a village with a garden on three levels, and a bedroom above the garage – accessible via a small staircase. “She worked with us for a year and it seemed to be going ok albeit with some ups and downs. Then, despite a review where she said the job was going fine, she was secretly looking for another position– and then announced she was leaving, with no warning. Communications had broken down between her and Bob and the atmosphere in our home became very awkward while she worked out her notice of four weeks. Luckily for us she was able to with immediate affect start her new job and left after two weeks. “In the early days recruitment was a long, drawn out affair; it took a long time from short-listing applicants to us actually interviewing them. The Direct Payments people often sent us unsuitable people; and there was one time when I thought I was interviewing one person – and they’d invited someone else! “It was a great success and she’s still with us now. We have two PAs; our second one has now been with us since 2011. Payroll deals with any national insurance contributions, pensions and contributions we have to make to HMRC. “ We make sure we do everything properly and have our own employers liability insurance. 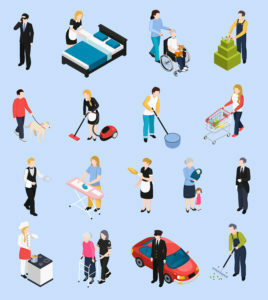 We take out the full policy, which could cover redundancy – as this is something your Local Authority may not consider. You have to think about the workplace pension and work it into your budget because not all Local Authorities will fund this. We always keep 2 hours in reserve (also known as banked hours) to cover any emergencies or cover for staff who are staff off sick or on holiday. One issue that has arisen for Roz and Bob has been satisfying an employee’s right to maternity pay and leave. “Dealing with maternity issues was quite a learning curve for us” Roz reflects, “We rang our insurers – Fish – who advise you on maternity employment law. We had to conduct a safety assessment of the job and have had to provide a letter of entitlement and responsibility, which details, among other things, what our PA is not allowed to do whilst she is pregnant - like heavy lifting or handling. We then had to inform our social worker about the situation we were now facing. Extra funding would be needed short term, to employ someone to shadow her to do the tasks she was no longer allowed to do whilst still working, and then for maternity cover, which potentially could be up to 52 weeks." “The downside of having PAs is that when things are quiet, like in the winter when you can’t get out, you can struggle filling the hours. Roz and Bob would definitely recommend having a PA.
By employing a Personal Assistant, you are enabled to lead an independent and active life both within your own home and in the wider community. “Use your Direct Payment to pay for the help you need, “she says, “And then really take up the opportunity. Don’t feel you have to stay in, or behave in a certain way when they’re there – it’s all about your independence.